Santiago de Cuba is the second largest city in Cuba. 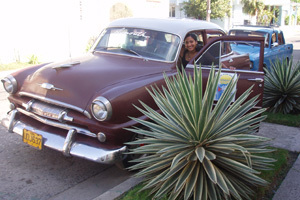 Lying in a large bay, at the foot of the spectacular "Sierra Maestra" mountains, Santiago is known as the most "Caribbean" and exotic town in Cuba. Here our students are placed with host families and have Spanish classes in "mini-groups" of a maximum of 3 students. 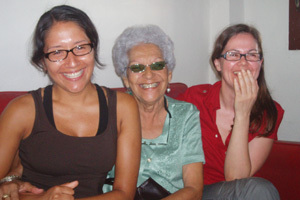 Spanish lessons are held in teachers' homes, in host families, or else in a nearby Cultural Centre, always with a fully qualified native Cuban teacher. The host families all live in a quiet residential area of Santiago de Cuba - Reparto Sueño - situated within easy walking distance of the historic town centre. As the families are all in the same area, it is easy for students to meet up. Many rooms have air-conditioning and some have private bathrooms. However, the standard of accommodation is still basic. Fly to Havana. From Havana fly to Santiago. Trinidad (50,000) lying on the South coast, is the best preserved Spanish colonial town in Cuba. The beautiful beach is just a short bus ride away. At night, the atmosphere is wonderful, with live music and Salsa dancing in every bar. However, being much smaller than Havana or Santiago de Cuba, with far fewer students, and more difficult to reach, Trinidad is really a destination for the more adventurous! Lessons are in the teacher's home, or the teacher goes to your host family. 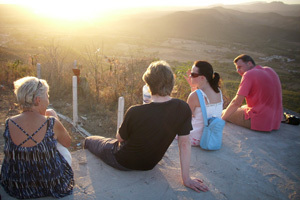 Fascinating optional excursions - tobacco factory, mango farm, rum museum, beach trips etc.